If you were always looking to get a fair skin and felt that your brown or dark colored skin was a curse here is something for you. The color of our skin is determined by the amount of pigment called melanin in it. Strangely all skin types have the same number of melanocytes or cells containing melanin which is about 10,000 cells per square cm. So why do we have different skin shades ? So why do we have different skin shades ? In the recent book by Sharad P. Paul a New Zealand-based skin cancer specialist called Skin : A Biography, he talks about skin color evolution. According to her the skin color depends on two factors first the evolutionary response and the the adaptive response. We all human beings have evolved from apes, the advent of apes was around 28 million years ago while we humans have evolved about 100,000 years ago in Africa. It was here that the skin color started to take shade for the first time it was the fight between vitamins, folic acid (folate) and Vitamin D.
Why the fight of vitamins and why our skin is colored? As the first of our ancestors started to walk upright they became more active and this increased their body heat. This in return turned to hair loss, until they become naked apes or a primitive man. Though with this change there was a concurrent need to preserve the folic acid in the body. Folic acid is essential part of the body and is needed for reproduction. Lack of folic acid can lead to defects like spina bifida in a child’s body. Sun light destroys folic acid and hence to prevent this the naked skin of humans become black from pink. This helps in preventing sunlight from penetrating through our skin, a darker shade is less absorbent than a fairer skin, which means sun light does not pass through the upper layers of the skin. This is what made the African skin black, while the skin of people near the poles is lighter in shade. As the folic acid is directly related to birth defects and reproduction our body created a defense mechanism of itself. This is the reason for the larger population and less birth defects in Asia and Africa. 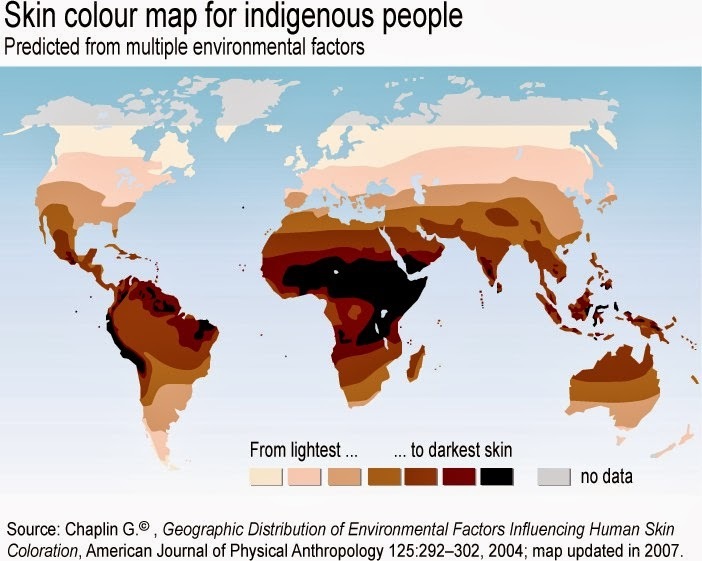 As modern man moved from Africa to other parts of the world like Europe our dark skin prevented the absorption of Vitamin D. Some parts of the northern hemisphere don’t see sun for six months. This caused Rickets a kind of disease where the bones become soft and bend, it also causes infertility. Hence with time to prevent the cause of both our body developed lighter skin shades for humans living in colder areas. So if you think dark skin is associated with disease you are wrong infact it is superior but only in areas where there is more sun light while whiter skin is best suited for colder areas. So if the people from the northern hemisphere, their skin which is not suitable to handle direct sun light will be prone to cancer and freckles, unlike brown skinned people whose skin is protected by the pigmentation. He also says that in next 2000 years white skinned people will become a bit brown and so will the African skin, so most of the people will turn brown. So next time you see a fair skinned person remember it is just biology.